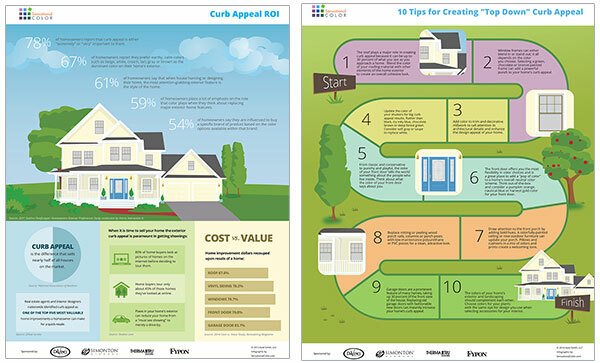 Grab copies of these FREE “Creating Curb Appeal Tip Sheets” to learn how to add value to your home. You can received the Curb Appeal PDF tip sheet’s via email. Hi, it’s Color Expert, Kate Smith here to demonstrate how to create curb appeal for your home’s exterior using color on a few key elements of the home. I uses a “top down” approach to make the process easy. Starting with your roof, moving on to windows, siding, doors, and trim pieces, I gives tips and tricks for giving your home a harmonious look using color. I’m Kate Smith and I’m here to show homeowners how to add color and design appeal to their home exterior. While some people may think that creating curb appeal starts with the front door, it is best to start from the top of the house with the roof, then work down to the windows, siding, door and trim to create the most eye-pleasing palette. Just as design and color harmony are essential to a beautiful interior, the same is true for the outside of your home. Start at the top and work your way down to create a coordinated look. Keep in mind that no single exterior element can stand alone. It is the marriage of design, colors, and materials that gives your home a cohesive look and maximum curb appeal. I selected these products and colors because they all work together. Start with your roof. It must be in great condition and look good. An imitation shake or slate 50-year polymer roof like these two examples from DaVinci Roofscapes — Harbor Gray Blend and European Blend — can upgrade the overall look of your home, making it a great investment. And because the roof isn’t replaced very often, your roof color is the perfect starting point for creating a harmonious color scheme. Next, the windows. Give old windows a facelift. Simonton vinyl Windows are low-maintenance, and energy efficient with many exterior color options. The frame and grids on this window are in bronze color. Having frames and grids in a color that complements the other elements of your home ties into your curb appeal. Once you’ve looked at the roof and windows, put a critical eye on your siding. Does it enhance the look of your home? If not, it may be time to power wash or repaint to bring back its original beauty. Now it is time to think about your front door. An energy-efficient fiberglass door with decorative glass doorlites like this beautiful door from Therma-Tru can really enhance your curb appeal. You can choose woodgrain or a smooth, paintable surface, like the one I selected here. Don’t be afraid to go bold. I wanted the color of the door to “pop” so I choose a color called Fine Wine. Next, architectural elements — moldings, columns, and trim — also make your exterior special. Consider adding an easy-maintenance polyurethane pediment, crosshead or shutters to the home exterior. The samples here are from Fypon, which actually started National Curb Appeal Month. Here are a couple examples of how all of the elements I’ve just talked about work together for top-down curb appeal. As a bonus, all of the products I’ve shown you are low-maintenance and resist moisture, rot, insects and decay! Add lighting, a few accessories and some colorful and well-groomed landscaping, and you’re set with a powerful home exterior. To find more about the things I talked about today plus many more idesa for enhancing your exterior go to my website sensationalcolor.com where you’ll find several free downloads including two ebooks that will tell you exactly what every homeowners needs to know about creating curb appeal. read everything at single place.